they are so sweet!you are both so wonderful for getting them out of the shelter and fostering them.thank god for people like you! SQUEEEEE!!!! How the HECK did I miss this thread?? OMG, so adorable and so lucky to have Jenn & Lou as guardian angels. So Jenn, am I understanding this correctly, you're thinking of keeping one of the girls? That is so awesome. And Lou, call me biased, but I don't think Cicero could possibly have a better family than with you and PB. But that is just my opinion, of course you have to do what's right for you. Oh this is exciting, we get to see these little love-bugs grow up! Hey!! Neelaa has a silver streak in her tail! But I think it's slowly going away, it's not as pronounced now as it used to be. REALLY??? I didn't know that.... Guess, Kyra doesn't have one.....can she get one later?? Oh! Oh! Miss Pooh Bear! You are so lucky having a little chowling. He is gorgeous! Are you going to look after him for ever. We have been looking for a chowling but the strawberries are finished and there wasn't a chowling so now we are looking in the brambles but we have not found a chowling yet. He is such a little adorable chowling and you must talk to him and teach him Chownese and how to be a good boy and cuddle your Mommy. Any updates on all these little guys? Lou, how is Ms Pooh Bear doing with her new little friend? I haven't heard back from Jenn in a while - she has been very busy. The little ones are still with the other foster mom. It's been two weeks since Jenn rescued them so I believe RDR wants the little ones to stay together for a bit longer. Two weeks after their rescue. The chowlings are now 7 weeks old and thriving. Thank you for those who sent donations and sponsored a chowling. I am really sad. This morning, Jenn and I went to pick up the chowlings from the foster parent in Danville. It was a nightmare. It was a horribly uncomfortable situation. The foster mom decided to keep both Desdemona and Cicero. Cicero was always going to come back to me either to foster or foster and keep. The foster mom knew this in advance and the foster dad knew that I was the one who was going to be Cicero's mom. But when we got there, it was horrific. Long story cut short, and after wasting a half hour to forty five minutes with these people, I made the decision and told Jenn it was okay for them to keep Cicero. They were so reluctant to bring him out for us to see. They also were extremely disrespectful to us. Anyways, I've been teary-eyed all day when the thought of all this comes to mind. Lots of drama (not from Jenn or myself) but the foster's. I do have a chowling in house, Phoebe. She is sweet and pretty. The remaining chows started barking and got scared of Miss Pooh Bear when I brought her out to see which one would be okay with her. I was hoping to foster either Laszlo or Ophelia since two members are sponsoring them. But they barked and jumped back and away from Miss PB. Phoebe and PB (Miss Pooh Bear's nickname), quite a challenge when I call one of them. Phoebe and I went shopping and she got lots of attention and hugs and kisses. The pest control man came over to treat our yard and he had me take snapshots on his cell phone of he and Phoebe. But Phoebe is standoffish with Miss PB. Miss PB, as usual, has been extremely gracious! She even let the little one nosh on her PNutz (they are back on the market!). Tomorrow, a couple of the approved adoptors will be meeting the chowlings. They are going to be soooo lucky and so happy! Jenn and I will update you which chowling has found their forever mom and/or dad. I'm so sorry Cicero did not come home with you! Wouldn't RDR make the decision as to who adopts these lovies? Phoebe just needs to get used to her new situation...oh, the nerve! It's like a surrogate deciding to keep the baby! I am so sorry, Lou. I know you are not the type of person to do this, but I hope you follow through to RDR and let them know what happened. Don't let these boorish people pull a fast one on you. I don't care if they did foster, they did it for their own self serving reasons, it is quite apparent to me. Auddymay, Jenn is the RDR person for these chows. She had her foot down regarding Cicero coming home with me. Again, after a half hour to forty five minutes of dealing with the fosters, I made the decision to not cut baby Cicero in half to serve the *two* moms and just let that one keep him. I made the decision. It makes me sad. But I thought it out before I gave Jenn the go ahead. So, no. I'm not going go after these people for Cicero. It's really not appropriate to go into the details of what transpired. It is very hurtful. Jenn has already spoken to Pali about what occurred. They will talk about it more when all the board gets together. As for Phoebe, an hour ago I gave her a bath to prepare her for tomorrow's meet and greet. Boy, two wash basins full of black water! Now she is clean and bright and goofing around with PB. PB really is so sweet and calm. The little one was knawing on her hind legs and has been under her belly while PB is walking. I told PB I would pay her with chicken chips if she would chowling sit and she really is doing that... chowling sitting. Just a little while ago, she nudged me here at the computer room to go open the door to outside. I thought she had to go, but it was the little one. She sat there and after the little one was finished with her duty, PB walked back inside and the little one followed. Paid her 5 chicken chips for that! I know you wanted the Chow but if the people are good Chow people, have a good home and wanted to keep the two Chows together there's 5 more of them, whats the problem? If none of the above, get them out of there, they were fosters, whats the problem? There is no problem, Jeff. I'm just sad, really sad. Like Auddymay wrote "like a surrogate decides to keep the baby". That's it. I'll be happy when the chowlings all get adopted and I can move this thread to the rescue section and put it to a close. You'll not know how deep my sadness is at this moment, even though I am fostering Phoebe. Not being very magnanimous as you are Jeff, I would not see someone who pulled the rug out from under me to a chowling I well could adopt as being a nice thing to do...but then, I tilt at windmills. Already having a female, Lou would likely be more comfortable with a male being added to her family. Especially one that has already touched her heart. And it sounds like they kept the female Jenn had her heart set on. Cheeky monkeys, I say. Be glad I wasn't in charge of their placement, I would have walked off with them all, away from these somewhat selfish people. I'm far from forgiving and unselfish when a human is involved but a Chow or kid that's a differant story. I understand wanting something and being disappointed you didn't get it but the name of the game is a good permanent home for the puppies. Nothing has been said about the people, if its a good home and a permant home then you might be sad for losing him but happy the Chows are together and found a good home. If they are keeping the two with breeding on their minds then that's a differant story I would do what ever to get them out of the home, they were fosters so even going back, calling the police or even stealing them out of that environment what ever it takes. I could care less about how much trouble I caused or who's feeling got hurt its the Chows that matter. If the Chows are happy and the people are good Chow people then great, pick one of the other 4 or 5, a Chow is a Chow no matter what the color of coat or how many legs it has. I'm not going to write anything about the people. That enough should tell you something! I don't want another chow from this litter. Get it. Now stop. This all too stupid to keep going on. Jenn and I will post when the chowlings get placed. There are more than plenty applications that are approved. Many from when Poe was needing a home, so these are people with chow experience too and right now don't have a chow. I have Pooh Bear and that is enough for now. The end.... and as Miss Pooh Bear would say *chow censored word*! Sorry to keep the wound fresh, Lou. I don't mean to do that. I would like to add, Miss PB has quite the repetoire of chow curses! Surely, she remembers them from her days before she came to you, right??? Auddymay wrote: ...Miss PB has quite the repetoire of chow curses! Surely, she remembers them from her days before she came to you, right??? Yes and no. She picked alot of it up from me too. I'm so sorry that Cicero didn't come home with you. I know what it's like when a chowkid steals your heart. I'm thinking like Auddymay, but then I don't know all the details. It is evident you chose to take the high road with the foster parents. I'm sure in this case, it is the right thing to do. Thanks, Bama. I wish I could say it was the right thing to do but that is not the case. It was simply what had to be done to stop the insanity. Good news about the remaining chowlings! Two have been officially adopted. Cyrus and Laszlo are with their forever families. I was not there when Cyrus met his mom. So I could not take a picture. However, here is a photo of Laszlo with his new mom, sister and blue merle sister. That's Alyssa holding Laszlo and his new mom is April! Laszlo's forever family owned two chows. Both passed two years ago, two months apart. They lived to be 21 and 18! Linda, they live near you and they will be going to next year's ChowFest. Katalin, thank you for sponsoring Laszlo. He is in excellent hands. 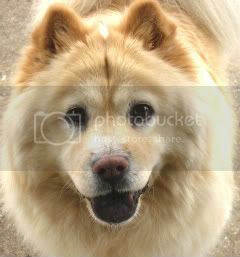 His new daddy was so excited to see his new chow son's photo transmitted thru cell phone. His new mommy was a vet tech and will have the best of care. He will also have the luxury of going to work with his mom every day! I left when another family was deciding on either Phoebe, Ophelia or Oberon. Will post an update tomorrow. Last edited by Zhuyos mom on Fri Oct 05, 2007 8:39 pm, edited 1 time in total. I hear Miss PB can bark curses in seven different languages, including chihuahua. Sorry to hear about Cicero, I would think the fact that he picked you and Miss PB to be his family would count for something in chow society. Happy news about the others, and Phoebe is lucky to get the chance to be fostered by you two. Happy News! The other family took Phoebe home (she's the one I fostered for a day) and are now her forever family (Mai - new mommy, and Marshall - new daddy)! Will post a photo once I receive it. Additionally, Phoebe too will be able to go to work with her new mommy! Karen, I hope Shiloh and Mr. N don't mind, but Phoebe took an extreme liking to the baby bunny Shiloh and Mr. N gave Zhuyo. Phoebe took baby bunny to her new home. Her new chow mix cousins are having a blast playing with Phoebe. Phoebe is reported as always wagging her tail with exuberance! Phoebe taking a nap on Zhuyo's chocolate glazed donut w/sprinkles. This weekend, a family will be meeting Ophelia and Oberon with the hopes of adopting them both!!!! Also, Cyrus' mom called Jenn to give her an update and told her that she bought a large slab of marble so Cyrus can have a special place to rest and lay on. Because she's worried he may overheat!